This book was not given to me and this review is not compensated. I bought it from Audible. These are my thoughts and feelings and they're probably quite colored by my current deployment situation. Oh well. Spoilers ahead. Proceed with caution. This book was such a conundrum and it's pretty formulaic chick-lit so it doesn't appear to be something one could dissect...at first. The farther I got into the book, the more confused I became. I'm going to break one of my own rules and post a synopsis from Goodreads, because explaining it would take too much time. First of all, they never tried therapy or counseling. Instead of getting someone on the outside to look at their marriage, they just...don't. In fact, their families are shocked that they've split up for a year. That tells me that they've never sought advice from anyone, on any problems. Everyone assumed things were good. And...what exactly was the problem? They fell out of love? Fantastic. Go to therapy and figure out why. There was no catalyst. No affair. No money problems. No "I'm leaving you, so good-bye". This was the firstest of the first world problems. Like, find a real problem and then I'll maybe (maybe) be able to feel for you. Lauren was a very annoying character. Ryan didn't exactly sound like a catch in many ways either, and I wasn't excited about the idea of them getting back together. Lauren made Ryan seem as unappealing as possible...it was more like he was this good friend she couldn't live without. And Lauren herself was awful. The whole "we met when we were 19" leaves a bad taste in my mouth. I get that MANY people end up with the person that they knew in high school or when they were just starting out in college. They have wonderful marriages. It didn't work for these characters. 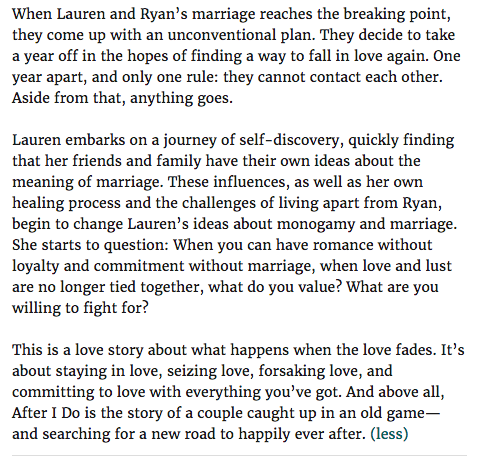 In this case, it seems like Lauren never found a hobby because boyfriend and then she had a crappy relationship at 30 and couldn't figure out why because they'd been together for 11 years and that meant they were meant to be. She was so incredibly passive; falling into a job just because, falling into a marriage just because, etc. Her whole affair with David struck me as odd. David also seemed unappealing. I didn't get what she was doing. Taking a break from her husband to date someone? Someone she didn't even like? For what purpose? Even though he knew she was still married, how was that fair to string him along if he were, in fact, wanting a relationship? That's really kind of mean. Same with what Ryan did to whatever women he was dating. Lauren's journey of "self-discovery" included going to work every day, going on a date, and walking her dog. If that's the case, I'm on a journey of self-discovery too, minus the date. I was expecting someone to go Eat, Pray, Love, but no. Nothing changed except Ryan moving into an apartment. This book is not being advertised correctly. The email hacking was frightening to me. I feel like whether or not they were reading each other's emails would've greatly affected the outcome of the book. Lauren never would've went on a blind date had she not known Ryan was dating other people. And then, since they were reading each other's emails, they weren't even sticking to the self-imposed parameters. It was like a double-blind experiment that wasn't double-blind, so it would've been invalidated. Obviously, I'm biased. But as someone who spends entire years without her husband, this was a ridiculous book. Their solution seemed way too drastic for what they needed, which was therapy. I didn't have an issue with the writing. It flowed just fine. The premise of the book was just so odd to me. Hmm I am intrigued by the premise of this book. It seems a little odd to me too. Wow. That actually sounds awful! I know that fiction is fiction, but there is enough wrong with people's approach to marriage in our society today. Books like this give people stupid ideas.